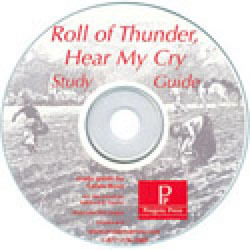 This Progeny Press Study Guide assists in reading and comprehension for your student as he reads through the book "Roll of Thunder, Hear My Cry". It will give a synopsis of the book, as well as background information on the author, and the historical setting. Activities include comprehension questions, character studies, critical thinking exercises, scripture application, vocabulary, puzzles, essay ideas, and project ideas. An answer key is included with each guide. This is a re-producable CD, making it convenient for multiple children within your family.